Hannah Genders explores a garden project that aims to add greenery to our urban spaces. I knew that at this year’s Chelsea Flower Show there was going to be a feature by a bit of a hero of mine in the design and horticultural world. The feature was called “Greening Grey Britain” and the RHS had sponsored the garden as a way of promoting a very important campaign about urban planning and greenspace. The hero I mentioned, the man behind the design and many other fabulous gardens in previous years, is Nigel Dunnett. Nigel is well known as a champion of planting up areas in cities to re-introduce flowers, biodiversity and wildlife, particularly through a style called “Steppe planting”. This is a style that copies the arid meadows of northern Europe, with drought-tolerant plants that are closely planted to make them lower-maintenance and allow them to grow tightly together creating a drift like carpet of colour – it also uses a lot of bulbs to extend the colour season. One of Nigel’s signature plantings in this style was completed at the Barbican Centre in London in 2015, and although I had read plenty of articles about these plantings I had never seen them, so as a prelude to Chelsea I went along to see these borders for myself. I must say they were a little difficult to find, and after quite a long time of wandering through dark concrete corridors I found them in an area called The High Walks. 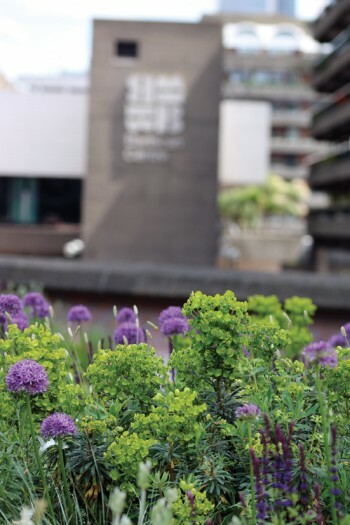 For any of you who don’t know the Barbican, it is brutalist, 1960s concrete architecture, so to see these swathes of colourful plantings against such a harsh backdrop was wonderful. The beds are quite large with drifts of grasses and perennials like Salvia nemorosa, nepeta and euphorbia; these were pulled together with drifts of the allium Purple Sensation. Another grass that was in flower and looking really good was Liberta grandiflora, which requires very little water and is evergreen with pure white flowers. There were also areas of ornamental woodland planted with Amellanchier and a dark-leaved elderflower. Nigel’s style has often been referred to as “low input, high impact” and for me the borders at the Barbican were definitely high-impact. There were a number of people enjoying the gardens with me, taking photos, sitting and chatting and even playing some music together. This is surely the way we want our cities to be in the future and it was this message that the RHS were pushing through the Chelsea feature. The Chelsea garden showcased how important plants and gardens are in an urban area, and that even the smallest spaces count. Most of the planting was again drought-tolerant, but there were also areas of planting for rain water capture which are particularly important as we experience more flash flooding now in urban areas. A frightening statistic I read recently said that more than 25 per cent of people are paving their front gardens – individually this may not sound a lot but the square meterage of paving like this in a large city creates huge amounts of run-off with no provision for capturing the water, which just overflows and floods into drains. The Greening Grey Britain feature also showed how front gardens can become interactive, social spaces where people grow food and gather together to share ideas and chat. It seems a peculiarly English thing to want to hide ourselves away behind high fences and hedges. Bring back the low fences so we can talk to our neighbours again, I say, and we need to design in more communal spaces. There are many recent studies confirming how loneliness is a real problem in our towns and cities today, and I believe our gardens and greenspaces could have a role in addressing this. Also in the garden feature at Chelsea were a bike storage area and compost bins, along with bee hotels like large dramatic towers – they have been a feature of Nigel’s show gardens in the past, ideal for attracting and retaining wildlife, and these looked fantastic. Most of the hard landscape in the garden was constructed with recycled materials, such as old concrete slabs that had been cleaned up and re-laid to show people that the build didn’t need to use expensive paving. A small balcony garden overlooked the communal space to demonstrate what you could do in a tiny courtyard to green up a building and grow some produce. This message is very close to my own heart and philosophy – we need to address the real and serious issues around climate change, along with human health and wellbeing, by re-designing our urban spaces with more flair and imagination for the way we want to live.